Bordeaux is a fascinating and complex wine region in the Southwest part of France. It is actually over six times the size of Napa Valley in California! You’d expect a region this massive to make all kinds of wine, right? Incorrect! 90% of wines produced from this region are reds, and to be more exact, red blends. 10% of Bordeaux’s production is a mixture of white wine and a dessert wine that would definitely be Winnie the Pooh’s favorite wine: Sauternes. So why blends? To begin with, there are 13 grape varieties that are permitted in Bordeaux, and if this seems like a lot, well, why don’t we travel back in time to the 1780’s to Pomerol and St. Emilion where a whopping 34 red grape varietals and 29 white varietals were once allowed (wine laws have become more restricted and some of these grapes are not extinct from this region). Each type of grape brings something unique to the wine; for example, Merlot adds a smooth texture to red wine, and Cabernet Sauvignon gives a wine structure. Standing within the Bordeaux wine region, we are about an hour’s drive from the Atlantic Ocean and surrounded by streams and rivers. The proximity to the ocean makes weather here prone to storms with rapid fluctuation in temperature, which is sometimes beneficial when growing Merlot and Cab. If a storm negatively impacted a winemaker’s Cabernet Franc grapes one vintage, but their Merlot tastes wonderful, the winemaker can choose to add more Merlot into that bottling. If winemakers didn’t have these options in Bordeaux, their farms wouldn’t be sustainable nor profitable. Additionally, water is so plentiful that overwatering and collected moisture in the vines is a challenge. 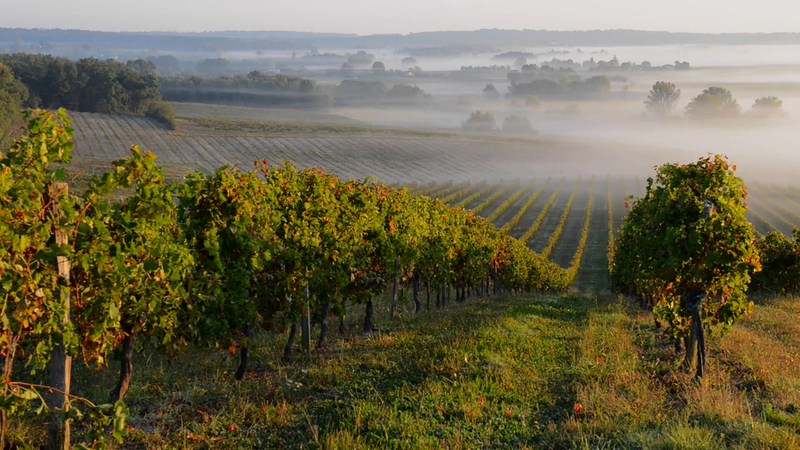 This is why some of the best Bordeaux wines are grown from vines atop gravel and limestone. If you’ve ever wondered what people are referring to when talking about a wine being ‘Left Bank’ or Right Bank’ you’re about to find out! To begin with, these wines will always be from Bordeaux. Secondly, three bodies of water called the Gironde, the Garonne, and the Dordogne are the heartbeat of Bordeaux. The Atlantic Ocean feeds into the Gironde estuary (fancy term for when ocean water becomes a river) and then the Gironde splits into two rivers. The Left Bank (the Garonne) is known for appellations like Graves, Sauternes, and the Medoc. Here they use higher amounts of Cabernet Sauvignon in their blends and their soil is full of rich gravel with smaller amounts of limestone. These wines are excellent for aging! If you’re drinking wine from Pomerol or St. Emilion, you are on the Right Bank of Bordeaux aka the Dordogne. While the Left Bank is full of towering Châteaux,the Right Bank has more intimate homes and smaller plots of land. The soil has more limestone than gravel which makes it perfect for growing Merlot with dashes of Cabernet Sauvignon. These smooth and delicate wines are ready to drink now! Part of the lure of Bordeaux goes back to the Bordeaux Official Wine Classification of 1855. Napoleon Bonaparte asked Bordeaux winemakers to rate their own wines for the Paris Universal Exhibition. Understandably, winemakers panicked (try asking one of us at the shop for our favorite cheese/wine and you’ll get a similar response ‘It’s like picking my favorite child’, is what Peter frequently says) and promptly procrastinated. Eventually the Bordeaux Chamber of Commerce was summoned to evaluate the wines and decided to rank them based on how expensive they were. Classifications range from First Growth (Premier Cru) to Second Growths (Deuxiemes Cru), Third, Forth, and Fifth Growth. When creating this ranking Napoleon said that this competition was never to be repeated again! The uniqueness of this competition is one of the caches of Bordeaux and is a part of the reason why their wines are so cherished. So, come try some Bordeaux! We’re really into drinking organic and biodynamic wines as you know, and Saturday’s line-up in no exception! Fun Fact: The name Bordeaux comes from ‘au bord de l’eau’ which fittingly translates to ‘along the waters’. Fun Fact: In 1953, Roald Dahl wrote a short story called Taste, in which two wine lovers argue about identifying a wine in a blind tasting-the wine they are discussing is from Château Branaire-Ducru! Fun Fact: The wine region Bordeaux is larger than all of the wine regions in Germany combined! Fun Fact: After decades of pestering the French government Baron Philippe de Rothschild is the first and only person to have gotten his Château ranking altered in the 1855 Classification to a First Growth status. Fun Fact: Letters have been found from the 4thcentury stating that this wine was served at Julius Caesar’s table! What It Tastes Like: Fresh strawberries and nutmeg galore. Fun Fact: Château Petrus in Pomerol (Right Bank) is one of the most counterfeited wines in the world.